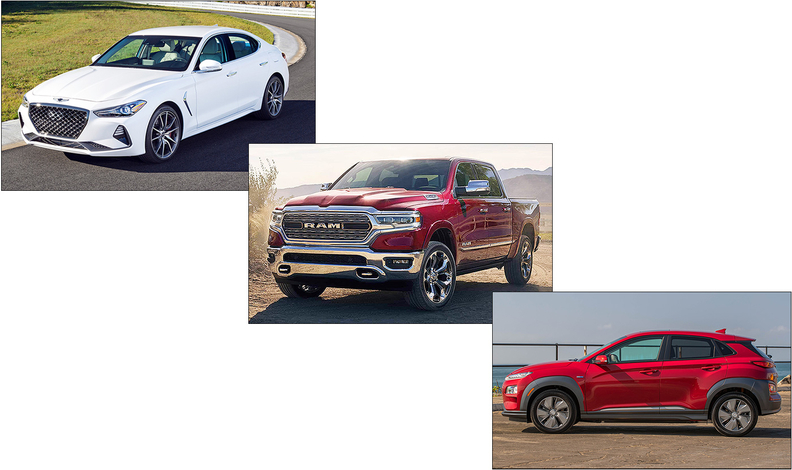 The 2019 winners of the North American car, truck and utility vehicle of the year are, from left: The Genesis G70, Ram 1500 and the Hyundai Kona. DETROIT — The Genesis G70 won the 2019 North American Car of the Year at the Detroit auto show, while the Ram 1500 took truck honors and the Hyundai Kona was named top utility vehicle of the year. 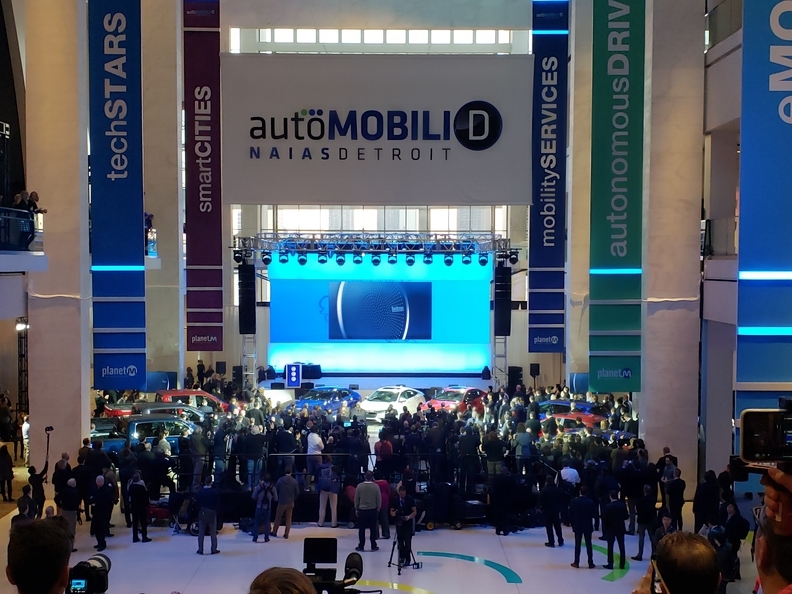 This year's winners were selected by a jury of about 60 American and Canadian automotive journalists — including Automotive News reporter Richard Truett and Senior Editor Sharon Silke Carty— from a group of three finalists in each category. A vehicle must have been redesigned or significantly changed to be eligible for the award. The Genesis G70 beat the Honda Insight and Volvo S60. This is the second win in the car category for Hyundai Motor Group, which won with the Hyundai Genesis in 2009. In 2017, its G90 was a finalist but lost to the Chevrolet Bolt. The Ram 1500 surpassed the Chevrolet Silverado 1500 and the GMC Sierra 1500. Only three vehicles were eligible for the truck segment, so by default, all three became finalists. Even though the Silverado, Sierra and Ram were all redesigned this year, the media lavishly praised the Ram for its interior. The Ram has not earned the finalist status since 2013, when the model took home the truck category win. The Hyundai Kona took utility vehicle of the year, beating out the Acura RDX and Jaguar I-Pace. This is the fourth year of the utility category — previously crossovers, SUVs and minivans competed in the truck category. It's also the first time two electric vehicles — the Jaguar I-Pace and Hyundai Kona — competed in the mix. Vehicles are judged on several categories including innovation, design, safety, performance, technology, value and driver satisfaction. Winners were selected in a third elimination stage. The three finalists in each category were chosen from a list of 14 cars, 12 utilities and three trucks in November. Models on that short list were narrowed down from a list of 47 in fall, which consisted of 23 cars, 21 SUVs and three trucks. The Audi A6, Buick Regal Tour X, Hyundai Veloster, Kia Forte, Mazda6, Mercedes-Benz A class, Nissan Altima, Nissan Leaf, Toyota Avalon, Toyota Corolla Hatchback and Volkswagen Jetta were the other cars on the short list. Other eligible utilities were the BMW X5, Cadillac XT4, Hyundai Santa Fe, Infiniti QX50, Jeep Wrangler, Nissan Kicks, Subaru Ascent, Toyota RAV4 and Volvo XC40. The diversity in this year's lineup made it challenging for jurors to vote for which vehicles should go to the next round, said NACTOY President and juror Lauren Fix. She told Automotive News on Friday that jurors knew the Genesis G70 would make it to the finalists round after they test drove it at the semifinalists event in October, but they had no idea what vehicles would take the other two spots. She also said she knew the Jaguar I-Pace and Acura RDX would make it the moment she got into the vehicle. The Jaguar I-Pace and Hyundai Kona make it the first time that the NACTOY has seen two electric vehicles in the mix. This year's top nine also includes the Honda Insight, a hybrid. Fix said she was surprised the Kia Optima wasn't a finalist because drivers can get "everything they want in a vehicle for $24,000." She added: "But then what vehicle would I take off the list that wasn't as good? That's the question." The NACTOY president said the nine finalists demonstrated top quality, good technology and nothing short than best in safety. Since contenders in the truck category were finalists by default, Fix said the winner is one that demonstrates the best towing capacity, performance and safety features. In other words, it's about hauling people, hauling objects, and its utility and capability, she said. The Honda Accord, Lincoln Navigator and Volvo XC60 won the 2018 North American Car, Truck and Utility of the Year awards.